Is there a better alternative to Token? Is Token really the best app in Applications category? Will Token work good on macOS 10.13.4? Token helps speed up the work you do in Pages, Keynote and Numbers. Interact with your iWork apps from your Mac's menu bar. Don't wait for an app to launch and then choose a document you've just used. Go to the Mac menu bar, choose Token's icon and open a recent document. Similarly, go to Token when you want to start a new blank document or use your own template. When did you last save that document you're working on? Let Token save your iWork documents every 10 minutes. Token needs a rating. Be the first to rate this app and get the discussion started! 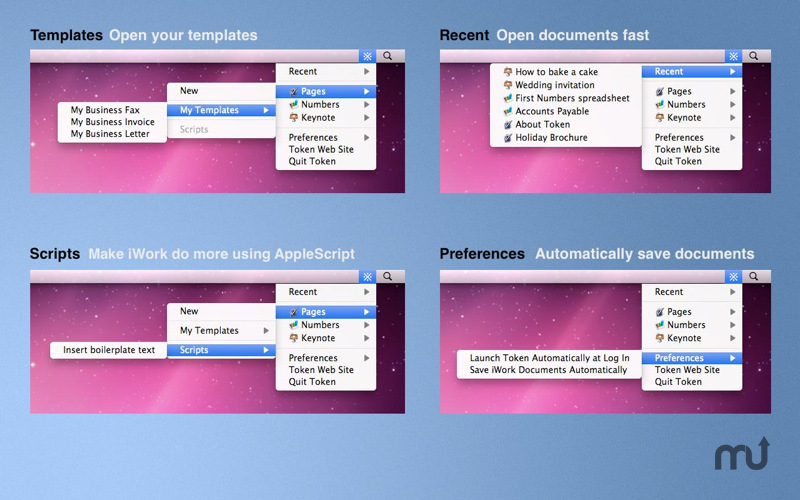 Download AppleScripts then trigger them from Token's menu. Visit the Token Web Site to download scripts you can customise for your own tasks.